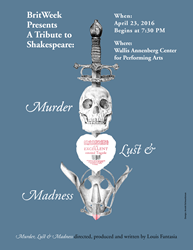 BritWeek will stage a tribute to the 400th Anniversary of Shakespeare with a one-night-only performance titled "Murder, Lust, & Madness" at the Wallis Annenberg Center for Performing Arts on April 23rd. BritWeek, the largest and most visible celebration of British creativity and innovation in Los Angeles, will stage a Shakespeare production, titled "Murder, Lust, & Madness," in honor of Shakespeare’s 400th and BritWeek’s 10th anniversary. The acclaimed cast includes: Ioan Gruffudd, Joely Fisher, Lesley Nicol, Stacy Keach, Patricia Heaton, Michael York, Harry Hamlin, Eric Braeden, Jimmy Akingbola, Karen David, Joan Van Ark, Victoria Platt, Ashley Bell, Adan Canto, Jane Carr, Suzan Crowley, Neil Dickson, Judy Geeson, Michele Greene, David Hunt, Robert Wisdom, and Joe Spano, with musical performances by Jen Lee, Randy Guiaya, and Sherry Williams. Noted Shakespeare expert and Shakespeare scholar (Globe and Huntington productions) Louis Fantasia will return to write, direct and produce the performance, which will feature an all–star cast. Sponsors include King’s College London. Tickets are available here.